Attacks on Palestinians continue, and among these, victims include disabled people. Last year, hundreds of disabled people and rehabilitation NGOs sent a letter to the UN office in the strip following a march organised on the International Day of Persons with Disabilities. The march included calls on the UN and the international community to put pressure to stop the Israeli occupation and the violent attacks, including on disabled people. Disabled people are among those most vulnerable to the well documented and evidenced brute force and abuse of power by occupation forces. But the attacks remain dramatically unreported in international media. 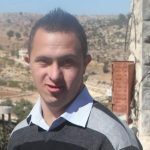 The Bethlehem Arab Society for Rehabilitation (BASR) claims one of the latest victims is Saleh Issa, a 39 year old Palestinian with an intellectual disability. According to the organisation, he was shot at close range with an expanding bullet on March 11th by Israeli occupation forces. “An Israeli Occupation soldier shot Saleh from a short distance, and had arrested him for a couple of hours earlier the same day, despite his knowledge that Saleh has an intellectual disability and was not a threat in any way to the Israeli armed forces”. He went on to explain that reaching Saleh, giving first aid and getting him to hospital was met by more gunshots forcing them to leave Saleh behind. There were two other casualties involving the emergency teams and the Palestinian Red Crescent Society (PRCS) ambulances were damaged. Saleh was only evacuated later when his situation had become critical, an evacuation again met by heavy firing. The First Aid Crew got Saleh to Beit Jala Public Hospital, but was then referred to the Specialized Rehabilitation and Surgery Hospital at the Bethlehem Arab Society for Rehabilitation (BASR) in need of urgent surgery. Fragments of the bullet were removed from his leg, but Saleh may need additional surgeries in the coming days, with the risk that he may also lose his leg if the condition deteriorates. Saleh’s family expressed concern stating that this attack was unprovoked on a man who was in no way involved in any activity against the occupation forces. They went on to express that their son was yet another victim of Israeli human rights violations and brutality. This attack may be one of many. BASR goes on to report that only the previous week Israeli occupation soldiers had attacked a child with a hearing impairment in Husan, a village west of Bethlehem. On this particular incident, a military vehicle stopped beside the child, four heavily armed soldiers got out of it and mercilessly beat the child, leaving him with a broken arm, contusions in his face and body, injuries in his legs, and psychological trauma.